The best-known native textile art in North America is the weaving of Navajo Indian blankets and rugs. These impressive (and expensive) wool rugs are still made in a style that was traditional in Mexico and the southwest United States long before the arrival of Europeans: kneeling before a vertical wooden-frame loom and using a shuttle to weave colored threads together into large-scale geometric patterns. Originally Navajo and other Southwest Indian blankets were made of hand-spun cotton thread, but after the Spanish brought domestic sheep to the region the Navajos switched to wool. Though Navajo blankets and rugs are the most famous weavings in North America, they are certainly not the only native weaving tradition. Finger-weaving has been important throughout the continent since ancient times, and finger-woven blankets, tapestries, and clothing are still made in many tribes. 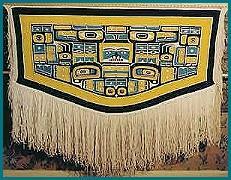 The chilkat blankets of Tlingit people are one of the finest examples of finger-woven Native American blankets. Seminole sashes and patchwork are another important Indian textile art. A more recent tradition is star quilts or blankets, which originated among the Sioux tribes (Lakota, Dakota, and Nakoda/Assiniboine) and spread throughout the Great Plains. 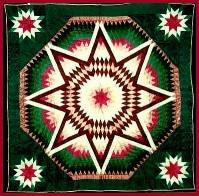 Quilting was one of many crafting techniques that Native Americans borrowed from European traditions and adapted into something unique to their culture. Star quilts are made by piecing a mosaic of cloth diamonds into the shape of the traditional eight-pointed morning star design of the Sioux. Before the evolution of star quilts, traditional Plains Indian blankets were made from painted, quilled and beaded buffalo hide. When the buffalo herds were exterminated this craft largely died out, but some Plains tribe artists still make buffalo robes and blankets today from the hides of animals raised in captivity. If you are looking to buy genuine rugs, quilts, or blankets that were actually made by Native Americans-- either because it's important to you to have the real thing or because you want to support native people with your purchase--then here is our list of American Indian artists whose native rugs and textiles are available for sale online. If you have a website of Native American weaving or quilting to add to this list, let us know. We gladly advertise any individual native artist or native-owned rug store here free of charge, provided that all rugs and blankets were made by tribally recognized American Indian, Inuit, or First Nations artists. Thank you for your interest in Native American art! On our main site we do our best to avoid slowing down our page loading with graphics, but this page is about art, so we'd really be remiss in not showing a few representative weaving pictures. All photos are the property of their respective artists; please visit their sites to see their work in more depth. American Indian rugs for sale by an award-winning Navajo weaver and his students. Contemporary Native American rugs for sale by Navajo weaver Anita Hathale. Click on the small photos for a better picture of her rug weaving--some of the thumbnails are really distorted, but the rugs themselves look great! Another good online store with Navajo Indian rugs and blankets for sale. Some of them use traditional weaving styles and others use original rug patterns drawing on the classics, such as the innovative design in this picture. Star quilts are a Sioux tradition, and this Standing Rock Lakota family has been making gorgeous ones for 70 years. 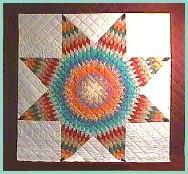 This Hidatsa-Arikara woman also makes nice Native American star quilts. 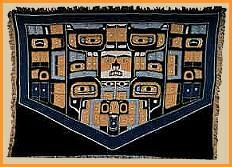 Chilkat blankets were traditionally woven by the Tlingit Indians out of mountain goat hair and cedar bark. They were five-sided, deeply fringed and were worn as capes during important ceremonies. The Chilkat blanket-weaving tradition largely died out a hundred years ago, and the antique ones are costing hundreds of thousands of dollars. However, here are a few contemporary Northwest Coast Indian blanket makers whose inspiration is the Chilkat weaving and designs of their people. This Tlingit woman has made painstaking reproductions of old Chilkat blankets by weaving cedar bark, merino wool and yarn in the traditional way. She does sell work on commission, but bear in mind that she weaves by hand and the blanket to the left took her two years to make. This Northwest Coast Indian store makes rectangular cotton-weave blankets using traditional Chilkat blanket designs. 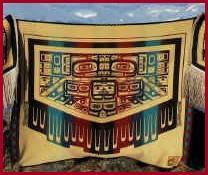 This Native Alaskan organization sells rectangular Pendleton blankets printed with Chilkat blanket patterns. Another Native American blanket making tradition that was nearly lost, this time because of the near-extinction of the buffalo. Now that buffalo products are becoming more available again, some Plains Indian artists are reclaiming the buffalo blanket. Buffalo hides tanned, painted, and beaded in traditional Arapaho and Shoshone styles. The artists also make similar blankets from less expensive elk and deer skins. Traditional finger-woven sashes for sale from a Metis artists' cooperative. An art history of modern Navajo rug weaving. Collectors' guide includes information on identifying, valuing and caring for antique Navajo rugs and blankets. Southwestern American Indian textile history and photographs. History of Native American finger-weaving, old photographs, and diagrams and instructions for young weavers. History and tradition of Chilkat Indian blankets, with photographs. Lovely children's story about a Sioux community and their star quilt, written in English and Lakota. Native American Textiles: Article about native weaving arts in various North American tribes. Navajo Weaving: Online museum exhibit on the traditions and designs of Navajo Indian rug and blanket weaving. Weaving Is Life: Information and photographs about Southwest American Indian blanket weaving. Navajo Chief's Blankets: Article about Navajo blanket and rug history. Chilkat Blankets: Photographs of old Chilkat Indian blankets. History of the Chilkat Native Blanket: History and traditions of Tlingit Indian blanket weaving. 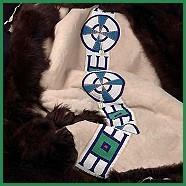 The Metis Sash: Explanation of the history and symbolism behind Metis sashes. Native American Arts and Crafts: Orrin contributed to this larger directory of authentic Indian crafts. About us: This website belongs to Native Languages of the Americas, a non-profit organization dedicated to preserving and promoting endangered Native American languages. We are not artists ourselves, so if you are interested in buying some of the Native Indian rugs featured on this page, please contact the artists directly. Though we have featured only American Indian blankets and rugs identified with the name and tribal affiliation of each artist, we haven't called the tribal offices to check up on any of them, and we only know a few of them personally. This is not an exhaustive list of Native American weaving arts--if you would like us to add your native rugs or quilts to this page, please contact us with your URL and tribal affiliation. We advertise any individual native artist or native-owned art business here free of charge. We do not link to rugs which are not made by tribally recognized American Indian, Inuit, or First Nations artists. And finally, websites do expire and change hands, so use your common sense and this general rule of thumb: if the creator of each individual artwork is not identified by name and specific tribe, you are probably not looking at an authentic American Indian rug.